Up for sale is my beloved 2006 e90 330i. This car has been like a child to me and I'm going to hate to see it go. I have owned this car since last December when I purchased it from a forum member on e90post. -I frequently commute from Burlington, Vermont to Montreal and NYC. This was my road-trip vehicle and as such, most of the miles have been highway. This vehicle has been extremely well cared for, never abused, never tracked. This car has never seen night on a city street, garage parked in the Upper East Side when in the city and parked in a secure, private lot when in BTV. -It has been the most reliable car I have ever owned and turns heads literally everywhere I go. -I own a business in Port-au-Prince, Haiti and I'll be moving to San Francisco in June. As such, I am not driving this car as much. I'm looking for something less rational and practical. My father drove a questionably street legal e30 325IS when I was a little kid and I've decided I need one in my life. I'm looking for an e30 with some balls. I will entertain offers for a trade of an e30 M3 or s50/52/54 swapped coupe+cash. Exterior shots, more photos coming soon. Last edited by DrFrankenwankle; 11-26-2012 at 05:51 PM. bump! this was my old car Runs like new still keep intact with the current owner! Bought this vehicle from Kemal last year and we've kept in contact since. Great seller and a great car. Open to any and all offers and I'm happy to meet anywhere in New England. You should post interior pictures as well. It will help you out! BTW where did you get your rear bumper from? I'll have some interior pics up soon, stay tuned. K3m0-330! He put it on before I purchased the car. 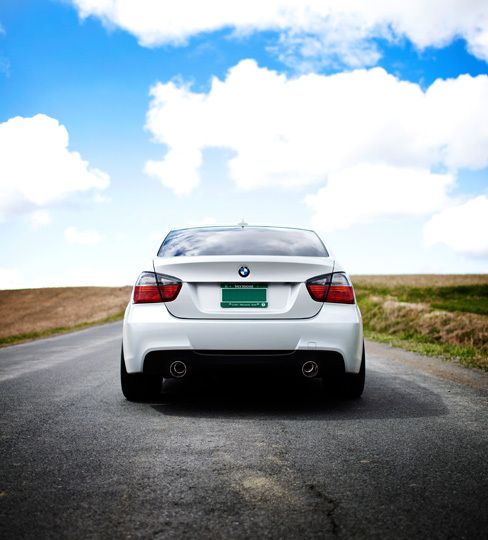 Oem m-tech rear with 335i diffuser and dual exhaust.. Thanks! How much is something like this cost? I might be interested in buying one if cost its reasonable. I have a local body shop I can go for the labor but would like to know about the parts etc... Sorry I dont mean to hack this thread of yours! all u need is just a bumper diffuser and a muffler shop. the bumper i got used for 300 bucks plus 80 for diffuser and then painting 300 bucks. and 100 for wedding and 50 for tips. great looking 330i. My TiAg 330i is a great car. Yours is a pretty sweet ride. GLWS. Awesome awesome car! e90 330i's don't get much better than this. Clean, tasteful and just downright stunning looks. Last edited by Falafel Combo; 01-11-2013 at 06:13 PM. Very clean, too bad I didn't check the forums when I bought mine! GLWS! any pics of the exhaust? wanna part it out? I just sold my '06 330i, and I have another very serious buyer willing to buy something right away.